Price excluding VAT.(Incl. VAT £2,148) *VAT Relief available on this product. The Roma Medical Sirocco powerchair is an extremely well-designed powerchair which has passed crash testing for your safety. It has rear-wheel drive and a highly responsive joystick control which provides a smooth ride quality. You’ll find it easy to navigate obstacles and busy shopping centres with ease. For stability, this powerchair has anti-tip wheels on the rear. It also has a robust, compact frame that will pass the test of time. So that you can visit everyday places, the Sirocco powerchair can be folded for quick and easy transportation within your car boot. To help you get you in and out of the chair it comes complete with height adjustable armrests, swing away footrests, and a height adjustable backrest. 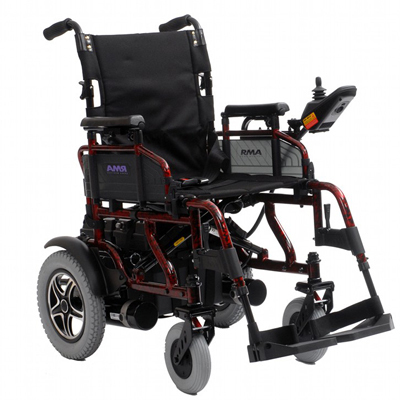 Whether you’re driving this powerchair on flat or uneven terrain, the 30cm (12”) pneumatic tyres and spring shock system on the rear will provide you with a comfortable ride. The upholstery is made using a hard-wearing nylon cord that remains resistant to everyday scuff marks. Additional standard features include solid tyres, flip-up armrests, and clothing guards making the Sirocco a real steal for the price. If you’re interested in the Sirocco or any other of our powerchair range, please call us on 02392 255600. Alternatively, pop into one of our showrooms in Waterlooville or Torquay.